J' Compamy C . . . . Height 5 feet 5 inches. Weight 9 stone 4 lbs (130 lbs). Chest measurement 30-33 inches. Complexion fair. Eyes brown. Hair brown. Sight and hearing both good. Colour vision normal. Limbs and chest well formed. Full movement of joints. Heart and lungs normal. Teeth good. Free from hernia, varicocele, varicose veins, haemorrhoids, inveterate or contagious skin disease. Good bodily and mental health. No slight defects. Stanley ROBINSON was the son of George and Mary (nee COX) ROBINSON, of 12 Argyle Avenue, Miramar, Wellington. Stanley was one of the first to volunteer, enlisting in Timaru on 12 August 1914, disembarking at Alexandria on 15 October 1914 and commencing duty in Egypt on 4 December 1914. Just five months later he was killed in action at the Dardanelles. Perhaps the only diversion in between was 5 days Confined to Barracks for being absent from 11 a.m. parade without leave on 26 December 1914. At the time of enlistment, he was residing in Timaru, working as a salesman for Fullers Pictures, and he was a door attendant at the Theatre Royal, Timaru, for 2 years. He intended to return to Timaru on discharge, which sadly never happened. He had attended Sydenham School, Christchurch. His brother Arthur Gordon ROBINSON (26/207) also served in WWI and was killed in action in 1916 at the Somme. (Not the Arthur Gordon ROBINSON recorded in this database.) 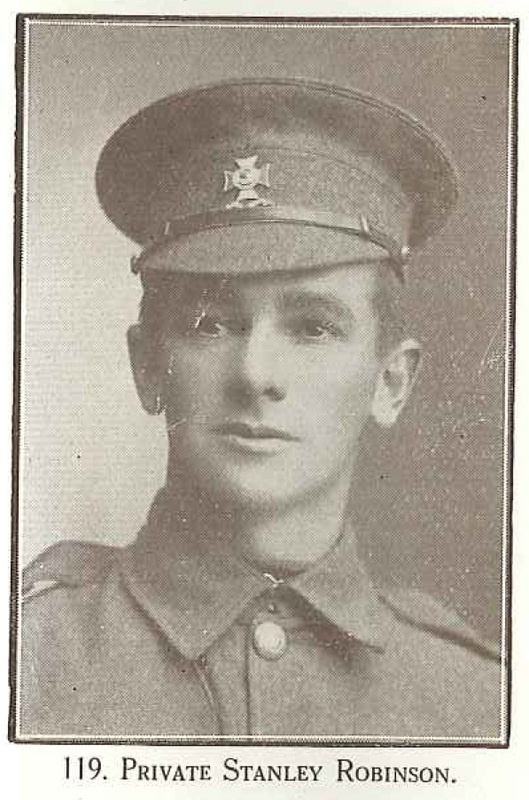 Just 13 days before being killed at the Dardanelles Stanley signed the briefest of wills - "In the event of my death I give all my belongings to next-of-kin." Did he have a foreboding? His mother applied for the War Service Gratuity. She was advised that, under the terms of Stanley's will, it would be paid to his father. His medals, plaque and scroll were all sent to his mother.